Our featured music this Thursday is "Hold On To Jesus" performed by Steven Curtis Chapman. Often times we find ourselves holding on to treasures that we deem are important. Recall what things, people, desires, projects and involvements you are holding on to. Are these treasures fleeting securities? Ponder on this for a moment. Speak to the Lord about what you consider treasures in your life. What is the Lord's invitation to you as you pray with this song? How will you respond? This site invites ALL members of the assembly to prepare for Sunday Mass by using this site. The site is definitely for clergy, for those who lector, for those involved in music ministry and even for the assembly. These pages, unlike most other web pages, presume that the user will want to slow down and contemplate the mysteries of the coming Sunday's Mass. By doing this they would be ready to join the assembly in communal prayer. Apart from helping people pray on the readings, this site includes a variety of ways to deepen one's understanding of the Sunday's readings. There is section about spiritual reflections on Sunday's readings for those who wish to find inspiration. There is a section about studying the scripture passages more in-depth and a section for music directors and conductors who wish to find music that might fit the Sunday's readings. It also provides ideas for General Intercessions or Prayers of the Faithful. This site comes in both English and Spanish versions. We hope you may find this website useful as you prepare to make your liturgies! 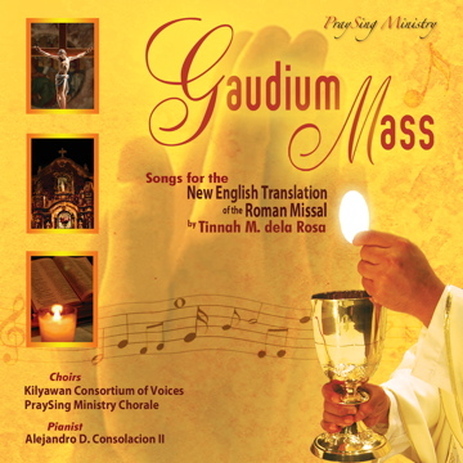 Our PraySing material today is the Gaudium Mass CD featuring 29 tracks for the New English Translation of the Roman Missal composed by Tinnah M. dela Rosa. The songs included in the Gaudium Mass were written to encourage active participation in the liturgical celebration. As such, liturgical, musical and pastoral considerations were interwoven while composing this mass setting. The general structure of the Gaudium Mass is antiphonal or a call-response which is designed to draw out the dialogical character of the mass and to enhance participation by the entire congregation. By emphasizing the dialogue between the congregation and the priest, a fuller, more active and conscious participation by the lay faithful can be fostered. The CD features the voices of Kilyawan Consortium of Voices and PraySing Ministry Chorale, and Alejandro Consolacion II as pianist. Liturgical Notes by Michael Liberatore are also included in the CD insert. The Gaudium Mass is also available in song book form at Claretian Publications. For more information on where to purchase a copy of the CD and songbook, please visit http://www.praysingministry.com/distribution-centers.html. Our prayer today is the song "I know you're there" performed by Casting Crowns. There are many things these days that challenge our ability to believe and have faith in God. There are numerous events that also try our capacity to give authentic praise to the Lord. These are not just the distractions and attachments that we have. They can also be the events and moments that leave us unable to comprehend and fully trust God's abiding love for us all. Amidst all these, the Lord continues to invite us to a daily act of faith. In this Year of Faith, may our Monday Prayer help you remember, renew or revive this faith in the Lord. Have a great week ahead! Many thanks to AudienceUvOne for the video! Click here to view the readings for next Sunday (February 3 , 2013) via the US Conference for Catholic Bishops website. Revised Roman Missal Q & A #21: What are the particular changes in the text (Part 7: Preface Dialogue )? Although this is usually recited in most masses, this dialogue can also be sung. Please view the video below if you wish to listen to the Preface Dialogue as presented in the Gaudium Mass. Welcome to Friday Inspiration! Our post today is the video "Beautiful Life" sung by Corinne May. After viewing this video, ask yourself the following questions: What is beautiful in your life? Is what wakes you up every morning that which is beautiful in your life? Pause for a few moments to reflect on this. How do you feel about these beautiful things in your life? Speak to God about them and express to him how you honestly feel. Express your thanksgiving and gratitude to God by passing on your sweetest smile to the first person you meet after reading this post. May you grow ever more aware of what is truly good and beautiful in our life so that you may live in gratitude for these gifts that abound in your life. Many thanks to Adhi S for the video! 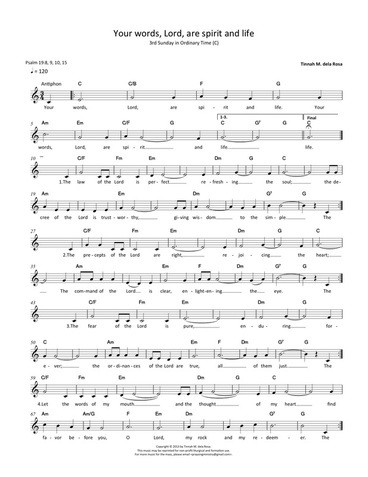 Our featured music today is "I will rest in you," a song by Jaci Velasquez. When the busyness of life gets a hold of us, it is easy to be distracted and unfocused. How do you manage to find rest amidst your busyness? Rest is not only a break that allows us to rejuvenate, it is also a break from the monotony of work, of constant anxiety, of being preoccupied. When the Lord created the world, he created for 6 days and rested on the 7th day. But to rest in the Lord is not simply taking a break from all that keeps us busy. It is really putting our trust and faith in God who assures us of a deep and abiding love, no matter what the circumstances. When was the last time you truly rested in God? Evaluate your life this very moment in terms of your work and rest. Speak to the Lord about this in prayer. What is the Lord's invitation to you? Many thanks to its Kat 2 u for the video! AWIT at PAPURI (Psalms and Praises) Podcast is a daily podcast featuring the Tagalog Mass Readings of the Roman Catholic Church. This podcast, brought to you by Brink Notes Podcast Network, aims to proclaim the Word of God to Filipino-speaking Catholics all over the world. This online project does not aim to replace the Liturgy of the Word in the Eucharist, but rather, aid in the reflection and meditation of the Catholic faithful. Provided in the Gaudium Mass songbook and CD are several options available to be sung: the "Penitential Act" (versions a and b) and "Lord, Have Mercy" (for cantor-choir and for choir). Our prayer this Monday is "Thank You God" from Igniter Media. Do you remember what you are grateful for? Have you stopped for a moment recently to say thank you to God for these? Today, let us all take a moment to express our gratitude to God in prayer. May our gratitude lead us to love as God loves. Click here to view the readings for next Sunday (January 27, 2013) via the US Conference for Catholic Bishops website. Revised Roman Missal Q & A #20: What are the particular changes in the text (Part 6: The Apostles' Creed)? In many Masses, the Profession of Faith then follows the homily, either the Nicene or Apostles' Creed. For many centuries the Nicene Creed was the only Profession of Faith used in the Liturgy. The Nicene Creed is a statement of faith dating from the fourth century, while the Apostles' Creed is the ancient baptismal creed of the Church in Rome. Following the Second Vatican Council, the Apostles’ Creed was permitted in Masses with Children. The current reform of the liturgy has permitted Conferences of Bishops to allow the use of the Apostles’ Creed in place of the Nicene Creed provided it is not used to the exclusion of the Nicene Creed. The new edition of the Roman Missal especially encourages its use during Lent and Easter Time because of its close association with the Sacrament of Baptism in the early Church. If baptismal promises are renewed, from a formula based on the Apostles' Creed, this takes the place of the Nicene Creed. 1. We bow at the lines referring to the mystery of the incarnation. On the Solemnities of the Annunciation and the Nativity, we kneel at these words. 2. The most significant change to the Apostles’ Creed involves a clarification regarding where Jesus descends on Holy Saturday – to hell, replacing the old translation 'of the dead'. This revives a tradition of the Church (grounded in 1 Peter 3:19) that is from the Patristic period. The new translation renders the Latin “inferos” with “hell” instead of “the dead”. The Latin original “inferos” means the lower realm, the place where the dead awaited the Messiah. The current use of “hell” refers to the place of eternal punishment but in old English, “hell” was also used to refer to the place of the dead. The use of hell reminds us of Christ’s solidarity with us to the depths of death and distance from God in order to bring about our redemption. You may read more about the meaning of the phrase "he descended into hell" via the Catechism of the Catholic Church (# 631-637). Although this statement of our faith is usually recited, special occasions and feasts call for this prayer to be sung. Please view this link (http://www.youtube.com/watch?v=1uRD506xy4M) to listen to an excerpt of The Apostle's Creed as presented in the Gaudium Mass. Our inspirational post today is the video "Landfill Harmonic." Have you ever thought about how much trash you generate? Just take a look at your trash can at the end of the day and think about how much you produce in a month or in a year. The movement towards reducing, reusing and recycling waste is certainly gaining momentum but this video reveals that there is even more than can be done with our trash - they can also be turned into musical instruments! What's more, the people behind Landfill Harmonic have also managed to bring young people together to make music and beautiful harmonies. Beyond inspiring us to recycle our trash, we hope you can also reflect on this video and use it for your own personal prayer. Perhaps you can ask yourself - are there areas of your life, projects or relationships that you have already begun considering useless or a waste? Recall each of them and bring them to prayer. Is there something you can still do to save them or to transform them into something more beautiful than how they currently are? Perhaps a new outlook, a gentle conversation, quality time or greater generosity could help in the transformation. What is the Lord telling you? How are you being invited to respond? Many thanks to LandfillHarmonic for the video! Today PraySing Ministry offers the Thursday Music post in honor of the life and ministry of Fr. Anscar Chupungco, O.S.B., STD, a Filipino Benedictine monk, who was a noted liturgist, theologian and a mentor to all Filipino liturgists and countless students of the Pontifical Atheneum of St. Anselm in Rome, San Beda College in Manila and Paul VI Liturgical Institute in the Philippines. As we mourn his passing, we also celebrate his life and his contributions in the field of liturgy and inculturation - two fields that have been influential in shaping PraySing Ministry's vision. Our music for today, is an instrumental version of the beautiful Latin song "Pie Jesu" from the album Requiem by Andrew Lloyd Webber and performed by the Royal Philharmonic Orchestra. We chose a wordless version of the music to help us all reflect and pray for all those dear to us who have passed on to be with our Lord. May your moment of silent reflection and prayer bring you to be even more grateful for the lives that surround you. Fr. Anscar, as you are laid to rest today, we thank you for your life and your ministry. May you rest in peace. Many thanks to carmsfavtoo for the video! PraySing Ministry's featured website for today is Labyrinth Online (http://labyrinth.org.uk). May your journey through the labyrinth of life lead you closer to our Lord. * The above description was excerpted from Michael J. Liberatore who wrote the Liturgical Notes of the Gaudium Mass Songbook, p. 58. Our Monday Prayer is "I Am," a song by Mark Schultz, courtesy of Elizabeth Haughey. What lines of the song do you resonate with about who God is? Do you sense an invitation to explore who God is in your life? Is God inviting you to renew or deepen your relationship? Is there an invitation from God to play a different role in life? Pray with those lines that struck you and speak to God about your relationship. Many thanks to Elizabeth Haughey for the video! The psalm setting for next Sunday is an original composition for PraySing Ministry by Christian Yanez, a composer, conductor and guitarist from Cagayan de Oro. 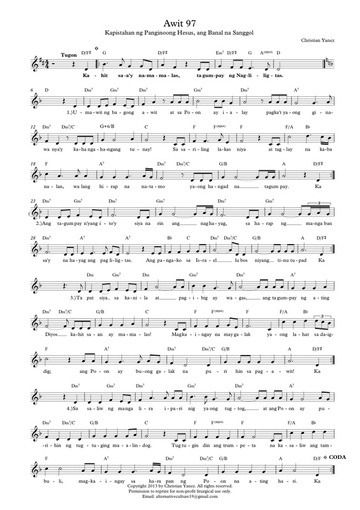 In response to our followers' requests, we are featuring a Sunday Psalm in Tagalog once or twice a month. Christian Yanez, will be one of PraySing Ministry's contributors for our Sunday Psalm posts in Tagalog. This psalm setting is for masses in Filipino during the Feast of the Sto. Nino. Click here to view the readings for next Sunday (January 20, 2013) via the Word and Life website. Click here to view the readings for next Sunday (January 20, 2013) via the US Conference for Catholic Bishops website. Revised Roman Missal Q & A #19: What are the particular changes in the text (Part 5: The Nicene Creed)? Like much of the words of the Mass, the Nicene Creed will be noticeably different when it is recited. If we are to worship well, we must know who it is we worship. The Creed reveals this — the true and living God, Father, Son and Holy Spirit. 1. There is the shift from “We believe” to “I believe.” “Credo,” the first words of this ancient text in Latin, is in fact the first person singular of the verb “to believe.” The change to the singular “I believe,” in accordance with the Latin, brings with it an invaluable opportunity to once again make the words of the Creed our own, words to guide and shape our understanding of the faith, and also to guide our individual lives and relationships. 2. The re-wording of the phrase "maker of heaven and earth, of all that is seen and unseen" into the more literal “maker of heaven and earth, of all things visible and invisible.” As Christians, we believe that there is much more to the world than that which can be measured, weighed, or placed under a microscope. A whole reality is around us that we cannot perceive nor control. Angelic beings are part of such a reality. This is an important reminder of the complexity of the created order, an order willed by a God who is a genius in his creativity. 3. The translation of the Latin term “consubstantialem” as “consubstantial” rather than “one in Being.” One of the central mysteries of the Faith is the belief in the divinity of Christ. Jesus Christ, who is like us in all things but sin, shares with the Father the divine nature. “Consubstantial” is a word derived from the scrupulously precise terminology of philosophy and metaphysics, and was devised by the early Church Fathers to defend this saving revelation against those who denied the divinity of Jesus Christ. 4. The Latin phrase “Et incarnatus est de Spiritu Sancto ex Maria Virgine” found in the second section of the Creed is now translated as “and by the Holy Spirit was incarnate of the Virgin Mary. . . .” To say that the Son of God was incarnate of the Virgin Mary is to proclaim a truth that took place at the very moment of Mary’s yes to the message of Gabriel. The womb of the Virgin was the first resting place of the Son of God upon his entry into the created world. These four changes to the English translation of the Nicene Creed do not exhaust the edits that will be noticed in the new translation. Furthermore, the new words and manner of expression will indeed take some getting used to. But the central truths of the faith, expressed succinctly in the Nicene Creed, are well worth the effort. Our 19th Friday Inspiration is the video 'Life is Like a Cup of Coffee' shared by Spiritual Stories on Youtube. As you view this inspirational movie, ask yourself, what 'cup' holds the life you are living? Is your cup one that distracts you from what is truly valuable in life? How fully are you able to live your life? Have the 'cups" you use to hold your life become a distraction or a help in living fully? Contained in the cup of our lives are what's most valuable in life and not just our life. What has value in your life at this time? Is God a part of what's valuable in your life right now? Search your heart for the answers and lift this to God in prayer. Speak to the Lord about what is most valuable in your life. Ask the Lord to help you see what they truly are. Seek God's guidance in helping you see clearly not just the cup that holds your life but your very life itself... and God's very self. In thanksgiving, we lift up to God the blessing of this life that we have. Many thanks to spiritualstories for the video! Our featured music today is "Be Still and Know," a song based on Psalm 46, composed and performed by Steven Curtis Chapman. Different times call for different responses. Sometimes we are called to speak out and take action. At other times we are invited to simply sit still and silently reflect on how God is present in our lives. No matter what circumstances are, take time this day to reflect quietly on the assurance that God is in control. Many thanks to brotherearl1994 for the video! Our featured website today is icelweb.org (http://www.icelweb.org/news.htm), the official site of the International Commission on English in the Liturgy (ICEL). ICEL is a mixed commission of Catholic Bishops' Conferences in countries where English is used in the celebration of the Sacred Liturgy according to the Roman Rite. The purpose of the Commission is to prepare English translations of each of the Latin liturgical books and any individual liturgical texts in accord with the directives of the Holy See. Catechists will find resources on the Roman Missal on this site while musicians and church music directors might find this site a useful tool for ICEL's music for the Roman Missal (in chant style). The texts and music on this site are for study rather than immediate liturgical use as authorization for use in a liturgical setting is the responsibility of the Bishops' Conferences. They may be reproduced free of charge in printed form, for non-commercial purposes, in publications not for sale, by parishes, dioceses, schools, and religious communities, provided that the copyright acknowledgment which appears at the foot of each page is included. You may click this link for the music section of ICEL. We hope that this gives you more music options for the mass. God bless you! After the gifts of bread and wine have been brought to the priest or deacon, the blessing of the gifts follows. This blessing is an important reminder that all comes from God, but we cultivate what we have received and produced - the bread and wine in our own lives - which we also offer to God in the desire to have them transformed. By using this dialogue, the congregation can be led to become more aware of how the gifts offered are from God and to help them respond affirmatively and with joy to the goodness of our God. This song is best sung by the priest and responded to by the congregation and choir during the preparation of the gifts. It must be noted that the lyrics of this song are intended to keep the focus of the congregation on the liturgical actions taking place at the altar. Even when the part of the priest is not sung, the conclusion to the prayer which is, "Blessed be God, forever" may be sung as the response of the people. * The above description was excerpted from Michael J. Liberatore who wrote the Liturgical Notes of the Gaudium Mass Songbook. Our Monday Prayer is a video interpretation of Psalm 91, produced by www.psalm91.org. This psalm offers several promises for those who abide by the Lord and dwell in his house. Which one speaks to you most? Why? Speak to the Lord about this in prayer. As you end your prayer, ask the Lord to help you grow in your desire and ability to abide by the Lord in this new year. Many thanks to JeanieRose1 for the video! To read the full biblical text of Psalm 91, please visit: http://www.usccb.org/bible/psalms/91. Click here to view the readings for next Sunday (January 13, 2013) via the US Conference for Catholic Bishops website. Revised Roman Missal Q & A #18: What are the particular changes in the text (Part 4: the Glory to God)? The Glory to God is a Trinitarian hymn of praise and supplication that is to be recited when it is not sung (GIRM 31). 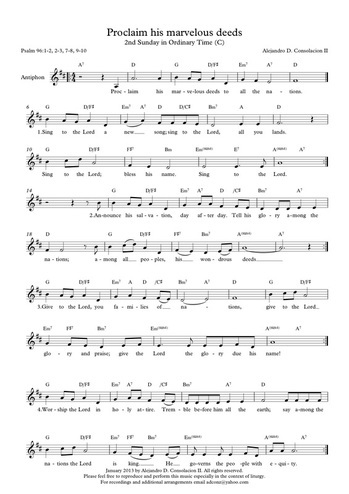 The emphasis is on the participation of the whole congregation singing this hymn of praise. As such, compositions using the Glory to God text are to be written so as to be accessible to the congregation to encourage them to sing along. As a hymn of praise, it is preferably sung rather than recited. The new translation shifts the focus to ensure it is more biblical and consistent with meter and rhyme of the Latin from which it is translated. 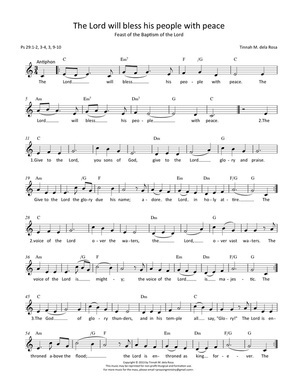 It begins by following the song of the angels from Luke 2:14, “Glory to God in the highest and peace to people of good will.” The next lines emphasize our appreciation for our God as we praise, bless, adore, glorify, and give thanks for the glory of God and then assert God’s being Lord, King and heavenly Father of all. We then shift to the titles of Christ that emphasize his relationship to the Father and to us, and then beg of Him to have mercy on us and receive our prayer. The remainder of the hymn is the same as the previous translation. 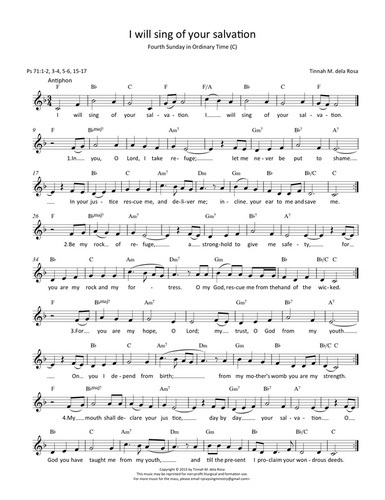 Of particular significance are the biblical references from which the titles, images and phrases that refer Jesus are drawn that remind us this song gathers these together as we sing our praise for our God who truly loves and is good! * The answers above have been excerpted from the Gaudium Mass songbook by Tinnah dela Rosa. Many thanks to Michael J. Liberatore and Claretian Publications for the Liturgical Notes. A music setting of the new Glory to God text is also in the Gaudium Mass songbook and CD. 1. Listen attentively and deeply. 2. Spend personal time with someone who really matters to you. 3. Take some time to thank someone who made a difference in your life. 4. Instead of giving gifts to one another, share them with those in need. 5. Spend time together in service or with others. As we come closer to the end of the holiday season, let's reflect on the ways where we can grow in our ability to be kind throughout the rest of 2013. May kindness be yours this year! Our featured music today is the 'Prayer of St. Francis' as performed by the Philippine Madrigal Singers in Rottenburg, Germany. This prayer, written by an anonymous French writer, reflects the spirit and outlook of the 13th-century friar for whom it is named. Try to dwell on this prayer for a moment. How is your life a reflection of it? In what areas are you being invited to grow? Speak to God about this in prayer. PraySing Ministry's featured website for this new year is Examen.me (http://www.examen.me/), a free online devotional and journal. The best thing you can do as you pursue God in 2013 is to have a consistent prayer life. Many people get overwhelmed as they seek to grow in their walk with Christ because they simply do not know what to do next. EXAMEN.me provides several convenient options that will help develop and guide you in your walk with Christ. EXAMEN.me is a simple-to-use web site that fosters your personal interaction with God. This modern approach to ancient devotional practices guides you to examen your life as you meditate on scripture, pray, and journal all of your reflections. No matter where you are in your pilgrimage with Christ, EXAMEN.me will help you interact with God. May this site be useful for your prayer life as you begin this new year. 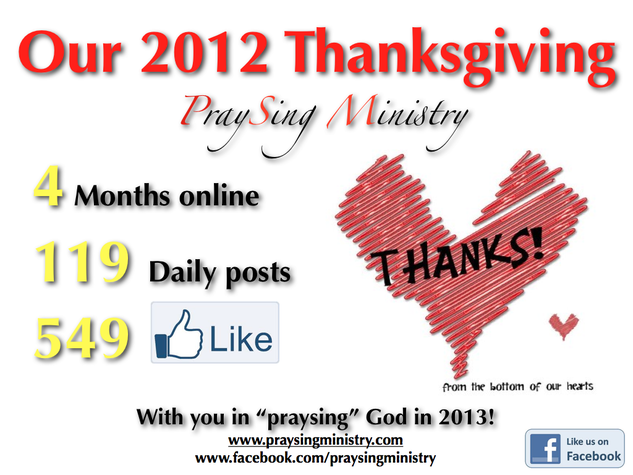 We are brimming with joy and gratitude for the year that was and look forward to another year of 'praysing' God in 2013. Thank you for LIKING us last year and for encouraging us in our ministry! May God bless us all! We hope you keep sharing this page with your friends! Together let's change our virtual culture into one that makes room for the Lord.